After visiting 17th century Japan and the American Civil War, DC’s Legends Of Tomorrow returns to a less demanding time period with “Compromised,” which sends the team to December of 1987 to stop Damien Darhk from interfering with the INF treaty that significantly reduced the U.S. and Soviet Union’s stockpiles of nuclear weapons. 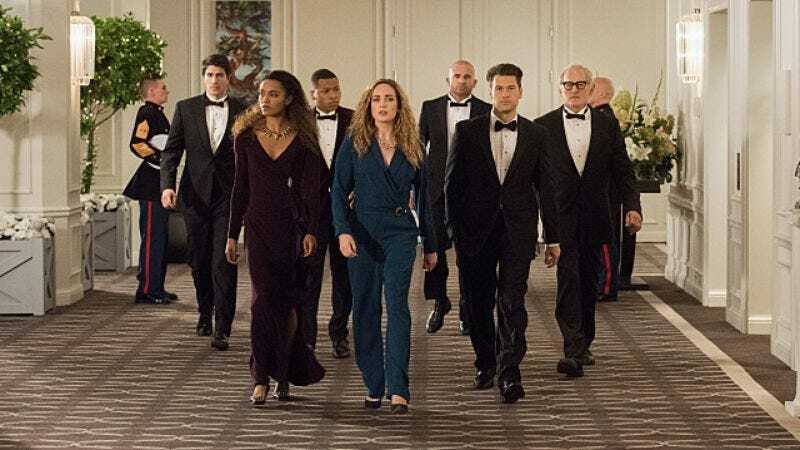 It’s not a great sign that DC’s Legends Of Tomorrow is returning to a period it already spent considerable time in last season, and while there’s some solid character development in “Compromised,” the team’s larger mission feels very repetitive. The opening scene with Damien Darhk conducting a drug deal in Miami suggests that this episode will be a Miami Vice pastiche, but instead the show returns to the Cold War conflict that dominated its last trip to the ’80s. The episode gets back to the budding Legion Of Doom story by giving attention to Damien Darhk and Eobard Thawne’s partnership, and the plot’s primary purpose is to get Darhk in a position where he’s eager to join Thawne. That happens when he’s defeated by the Legends, and there’s never any doubt that the team will be successful in their mission. That’s one of the big problems with having a show about people preventing big changes to the timeline: Unless the writers establish that the series is actually willing to take risks and make those alterations, there’s going to be a diminishing sense of danger with each new mission. I don’t expect this show to give us a United States where the Civil War never ended or the Soviet Union won the Cold War. The stakes of these stories are so high that they pretty much guarantee success for the heroes because it would be too difficult for the show to manage change on such a drastic scale. The solution is to make the threats smaller and more personal. This episode does strong work exploring Martin Stein’s relationship with his wife Clarissa, and a story that puts their romance in jeopardy is far more suspenseful than one preventing a nuclear disaster that won’t happen because there are other TV shows that share this timeline. It’s easier to excuse a lack of tension in the storytelling when there are memorable action set pieces, but this episode is lacking in that respect, too. Alasdair commented on how this show’s budget restrictions limited what it could do in last week’s episode, but that episode looks almost expensive compared to “Compromised.” The Civil War setting and zombie enemies required some effort from the design team, but there’s little thought put into the design elements of tonight’s episode beyond the costuming. The White House pretty much consists of one large hallway, and the state dinner looks like a sad wedding reception at a mid-scale reception hall. The grandiose plot elements of this series will only work if viewers are invested in the characters, and that means strengthening the team dynamics and delving deeper into who these people were before becoming time travelers. Martin’s one of the most well-rounded characters on this series because we’ve seen glimpses of his younger self, revealing how he’s changed over the decades but also how he’s stayed the same. There are some very convenient time ripples that put young Martin in danger this week, but they make for a surprisingly sweet storyline for older Martin as he realizes the ways he’s taken his wife for granted in the past. Victor Garber gets to activate some more powerful acting muscles when Martin proclaims his love for Clarissa to his younger self and tells him to cherish her more than the work he’s devoting so much of his time to, and you can sense how important Clarissa is to Martin when they share a dance together at the state dinner. Martin’s realizations about his own character make him a valuable resource for Ray, who is in the midst of his own identity crisis and needs guidance to help him realize his self-worth. Ray tries to act like Leonard Snart after receiving his cold gun from Mick, but Ray can’t tap into that cool personality and Mick doesn’t like it when he tries. Mick’s attempt to give himself a new partner just reminds him of the partner he’s lost, and it brings up emotions that Mick has no interest in dealing with, especially when he’s with Ray. Martin, Ray, and Mick all deal with their vulnerability in different ways this week, and while Martin and Ray take steps forward, Mick continues to bury his pain. 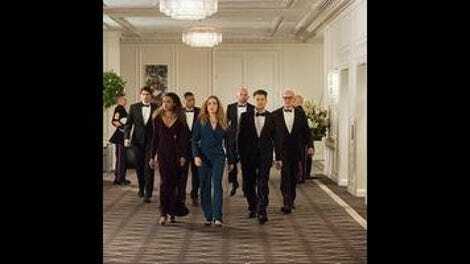 The JSA gives this show the opportunity to delve deeper into the superhero mythology of the Arrowverse, and we learn more about the World War II team when Amaya reconnects with her former teammate Todd “Obsidian” Rice (Lance Henriksen). He wasn’t with the JSA on its last mission in 1956 because he wasn’t deemed trustworthy (perhaps because of his homosexuality), but since then he’s given up on the superhero life and found happiness with his partner. Some of the most effective moments in this episode involve Amaya realizing what she left behind and how the world has changed (and hasn’t) in four decades, and Maisie Richardson-Sellers convincingly captures Amaya’s loss without losing the hardness that the character wears like armor. Amaya keeps herself at an emotional distance, and even though there was clearly a romantic relationship between herself and Rex Tyler, Amaya refuses to acknowledge it as something that existed in the moment. They planned a life together, but it was going to be in the future when they were freed from the restrictions of the JSA, and now that Rex is gone, she’s trying to deny the love they shared. This story would be more powerful if the series had spent any considerable time on Rex and Amaya’s relationship, but it’s still nice to get some more information about the JSA and Amaya’s role in the team. Nate and Amaya are being aggressively forced together—Nate literally walks into the med-bay moments after Todd tells her to seize any future opportunities for love—but Amaya sharing the story of Nate’s grandfather singing for the JSA is a great way of establishing a connection between them. As a historian and a woman from the past, the two of them could make for a fun couple, and hopefully the show will lay an emotional groundwork for their courtship to make it more engaging than the romantic elements last season. After witnessing the horrors of slavery last week, Jax wants to start making changes to the timeline that could do lasting good for the world. I have the feeling that this urge is going to become a bigger plot point for him as the series continues. I could watch Sara Lance beat up bad guys with her heels for an entire episode. More Sara Lance fight scenes! I like how ’80s references play into the story this week. Jax brings up Back To The Future’s Doc Brown when Martin warns him of the consequences of messing with the time stream, there’s a plot point involving the crossed streams of Ray and Mick’s guns (like Ghostbusters), and Kenny Loggins’ “Danger Zone” plays when the team infiltrates the state dinner. The dinner also a live band playing a jazzy version of “Danger Zone,” which gets a hearty laugh from me. Vixen taps into some new animal powers when she gives herself eagle vision, which also comes with a new spirit effect! Excellent delivery of “You goof” from Dominic Purcell when Mick is berating Ray. He somehow makes “goof” sound like a really mean word.